kecerdasan sebagai basis belajar. Siswa dalam hal ini akan tampil lebih baik dan jauh dari masalah belajar umum seperti kebosanan dan frustrasi. Sebagai hasilnya, mereka akan mengalami peningkatan dalam kepercayaan diri untuk terlibat dalam masyarakat. Pengaturan belajar dalam tulisan ini mendesain ulang kebutuhan belajar siswa. Partisipasi siswa melakukan pembelajaran aktif akan terasa nyaman nyaman dengan perubahan ruang kelas di mana semua siswa bisa bersenang-senang dan memperoleh percaya diri. Multiple intelligences tell that no student is stupid. All students are smart but in different areas. The treatment from environment either at home or school govern the destiny of the smart whether developed or disappear. This idea gains more popularity each day. More teachers and parents, who believe that human being should be smart, pay attention to this nurturing approach by Prof. Howard Gardner. They put it into practice in their field, both when teaching arrangement and solving students’ problems. Every student, either labeled smart or slow, owns multiple intelligences, at least nine intelligences, with them in different amount. They are verbal-linguistic, logical-mathematical, kinesthetic, musical, visual-spatial, interpersonal, intrapersonal, naturalist, and spiritual. If parents and teachers dedicate their teaching to develop some intelligences, then they would follow figures, for examples, Prophet Muhammad SAW who was a fine shepherd, trader, wrestler, orator, and leader; or Leonardo Da Vinci who was a scientist, artist, and athlete; or Alicia Keys who is genius both in education and artist career, or from Indonesia, Tompi who works as a surgeon and popular jazz song writer and singer. These people might have parents with similar skills in their blood, or grow-up environment that support the exercises of the intelligences become major strengths. The development of one intelligence becomes a very outstanding ability have been viewed through famous figures of every field. In every number of sport, art, science, etc there are legends either living or dead. They are people who have given their life to develop their intelligence since very early. Muhammad Ali is always remembered as the greatest boxer ever, Albert Einstein is remembered as the father of modern physics, and Rumi the most influential poet-sufis. Student learning style and preferences in the school is influenced by the state of the intelligences. Some students can learn very well from hearing teacher-explanation, some other might learn better when observing teacher-body language. Some others only understand after they do some exercises of experiment. Some students like number. Some students like words. Some students like graphs. Some students love music and rhythm in their any activity. Some others like peer-work and hang out together. Some students like to work alone. Some students like pictured and colored wall around. Some others like to study with their pet. Some students like to contemplate and think about the meaning behind things. If students are asked to perform learning in these ways, not teacher way, they would enjoy it. Teaching techniques in current university classrooms mostly side to verbal-linguistics and logical mathematical preference, such as lecturing, and student small group conference. Adolescents and adult are regarded mature learners, where those teaching techniques are thought fit. As the consequence, whatever subject university students take the same learning repeats and repeats. The students who like it perform better in the class, but the number is relatively small to entire class. Learning in university is stiff and boring for most students. On the other hand, university students are expected to develop their verbal communication and analytic skills as important skills of intellectual community. They are assigned in groups of discuss. Small group conference is applied since the first semester. Lecturers tell the students the important of talking during learning and award some score on students’ grade to motivate them. This seems to work for lecturers’ release. But in its progress, this technique has to improve if not to lose its effectiveness. Most students raise questions just to earn the score. Minor students feel exhausted with thick reading. Motivation in studying is up and down. Whereas, some scholars insist that learning should be fun and enjoyable. Happy learning is regarded only for children. However, students of any level would love it. Some innovations need to make in the classrooms. Some lecturers and researchers write reports of their efforts through education journals and forums. Multiple intelligences are paradigm that tells in general what educators can do with the intelligences. Students’ group-work conform it. Through peering, lecturers can assign different tasks and exercises multi intelligences. Students can participate greater as each gets a responsibility on his/her shoulder in the group. Excitement becomes possible to occur because students do activities which are based on their interest. One way to get university students complete their assignment is to get them working in groups. Grouping students is a part of cooperative leaning strategies. In here, student-grouping is decided by different means. They are challenged to solve problems given by using their present resources and spread excitements in the classroom. Students can help one another happily as a part to develop their social need. Lecturers take function as facilitator. Students may ask their lecturer or friends. They finish lesson while developing friendship. One another take turns to expose thought. By this arrangement, students can learn from both the lecturer and their friends (Olsen and Kagan, 1992). Mistakes and success become routines students are accustomed. Students challenge each others to develop cognitive and affective area. Students remind if friends are not clear. They work to produce good delivering as the lecturers demand to. They learn everyone’s strengths and weaknesses as diversity in community. Diversity is something advantageous, where everyone has different talents. By working in friendly groups, students are relaxed, active and energetic. Collaboration among peers extent and expand individual’s cognitive growth (Forman and Cazden, 1985). A basis to support student group work is that the students learn best when they learn through social interaction (Vygotsky, 1978). It promotes academic achievement, social and personal development, and language skills as well as motivation, confidence, interest of the study, and cooperation (Jacobs and Ratmanida, 1996). Students can argue, elaborate, explain, and negotiate their idea. Students develop awareness toward each other. They work together to complete assignment and to gain understanding. Communication, conflict management, decision –making, trust building, and leadership are skills students continuously exercise. The aim of grouping is to finish the task together and then be able to review what worked and did not work. Some studies report that student grouping give positive effect towards student’s achievement in solving problem (Slavin, 1992). They get more friends, voluntarily involvement, and increase learning motivation (Lazarowitz et al, 1996). Students in group activities gain new experiences, ideas and inspirations, where their way of thinking be more creative, developed, and mature (Gillies, 2002). Students with similar ability in terms of demonstrated potential or capacity may be grouped together to learn content at a modified pace and/or differentiated level of abstraction and complexity. Prior knowledge of particular content may be used to place students in a group together or have them spread among several groups. Also, the need to learn content knowledge may place students in a learning group, including whole class or interdisciplinary team. Students who demonstrate a need to learn a skill or develop proficiency with a skill may be grouped together. The quality of work habits may be used to place students in heterogeneous groups in order to broaden overall exposure to good modeling. Differentiating social behaviors may help place leaders, followers, talkers, and so forth, in certain groups. Providing students with opportunities to practice decision-making and acceptance of responsibility for choices is an appropriate criterion for forming some types of learning groups. Students who share the same interests may be placed in the same group for a project or activity. The task/activity criteria may dictate that certain students work together because they succeed best through certain kinds of projects. Sometimes random selection techniques, such as numbering-off, drawing lots, and so forth, are the most useful procedures to use in forming groups. Create the right type of group for the need. Sometimes an occasional informal ad hoc group is needed, such as pair and share. Base groups are formed for long-term social and interpersonal support. Formal learning groups are used when a commitment of time and effort is required. Keep group size small. Ideally, learning groups include no more than four students. Base groups may be larger, up to six students. Use ability grouping sparingly. Students across the spectrum of abilities benefit by heterogeneous grouping, especially low-ability students. Don't use cooperative learning for all instructional goals. While cooperative learning is a powerful strategy, it can be overused, or misapplied. Students need time to investigate ideas and pursue interests on their own. Use a variety of strategies when choosing students for groups. Many selection strategies (common clothing, favorite colors, letters in names, birthdays) will work when attempting to randomly group students. Facilitate success. Develop organizational tools, forms, learning journals, and other structuring documents that foster the smooth processes needed for effective cooperation and group work. Use online tools for ubiquitous access to forms. Support new groups. Cooperative learning is a practiced skill that requires monitoring and adjustment. Teach specific skills before grouping students, define criteria for success, and develop rubrics for key expectations. Meet with new group members to support their success. Heterogeneous grouping here is heterogenic ability. While, homogenous interest is recommended. The recognition of multiple intelligences gives the opportunity of collaboration, either by grouping students together by having the same intelligence profile or by having different intelligence profiles. Grouping students because they have the same intelligence profile can help them further develop their strong areas of intelligence, while grouping students with different intelligence profiles can help each other in developing the areas that they are weak in (Moran et al., 2006). According to Islam faith, human being is the best creature among all creatures. God has given humankind a high position as the leader of earth. Logically, to carry out the great function, humankind must be equipped with outstanding abilities. Howard Gardner, the proclaimer of multiple intelligences, believes that every child is intelligent. This idea seems logical, even though some other scholars call it as part of g factor, statistic item for measuring general intelligence in psychometrics. Whether this idea soothes those who fail in IQ test, but more and more educators apply the idea in their work field. Just type the key word on search engine, hundreds results come out within second. Way to raise the child determines whether the intelligences are developed or not. However, Prophet Muhammad SAW, has bequeathed Muslim parents to raise their children in a way that nurture the intelligences. "Obligation of parents to their children is giving good names, priming well behaviors, teaching swimming, archery, horse riding, feeding with good food and put them into marriages when they are adult." (H. R. Hakim). According to hadith above parents must teach their children multiple skills since early. Giving good name and teaching well behaviors is exercises of verbal-linguistic and interpersonal, swimming is kinesthetic, archery is logical-mathematical and kinesthetic, and horse riding is natural and kinesthetic. The prophet, in his history life, was an example of multi intelligences figure. He was known as a fine orator, thinker, leader, athlete and person with noble personality. Hence, intelligences may define as talents or natural abilities built inside every human being as gifts from God to function excellent in his/her life. Yet, being excellent in only one area has put many individuals to the peak of success. For example, legends in sport, art, science, or social life are genius who good only for their field. Say, Muhammad Ali. Edu Center (2006) sums the nine intelligences from Howard Gardner as follow. Bodily-kinesthetic intelligence is the intelligence of motor action and fine motor skill, the intelligence of athletes, dancers, and anyone who relies on physical skill. Interpersonal intelligence is that which corresponds with social behavior, empathy, and verbal pragmatics – simply the intelligence on relating with other people. Intrapersonal intelligence is the intelligence of individual reflection the type usually used by monks, writers, and psychologists. Logical-mathematical intelligence is the capacity for, as the name suggests, the challenges of logic and mathematics, the kind being employed by scientists, mathematicians, and philosophers. Verbal-linguistic intelligence is the intelligence of communication, of the written and spoken word, prevalently under the domain of writers, novelists, orators, and teachers. Visual-spatial intelligence is the language of the architect, the painter, and the engineer – skill in the form and function of visuals. Musical intelligence, well, it is the skill of the musician, the singer, and the conductor, and the capacity for the discrimination and production of musical sounds. Naturalistic intelligence is the intelligence of Darwin, or the capacity to understand and make meaning out of natural and biological phenomena. Spiritual intelligence is fashioned after the wisdom of religious leaders, and is said to be the capacity to recognize the divine. Many of MI practitioners are educators of young children up to middle school teachers. They are groups who thirsty with creative ways to teach their students. Many books and articles written address students of this range of age as the object. Yet, the theory of multiple intelligences also has strong implications for adult learning and development. Many adults find themselves in jobs that do not make optimal use of their most highly developed intelligences. For example, the highly bodily-kinesthetic individual who is stuck in a linguistic or logical desk-job when he or she would be much happier in a job where they could move around, such as a recreational leader, a forest ranger, or physical therapist. The theory of multiple intelligences gives adults a whole new way to look at their lives, examining potentials that they left behind in their childhood (Amstrong, 1998). Therefore, in universities, more lecturers seek ways to apply MI. They want to make the learning fun, where the students are studying pleasantly and attend instruction objectives successfully. MI at the same time, exercises the intelligences within the students. Therefore, researches of theses and dissertations discuss MI as new route of studies. However, universities have more problems to solve with MI than the educational levels below. The students are going to throw themselves in real society life immediately. They should be ready to work and use what they have learned in university to survive. If the students were passive learners and studied little knowledge, they would have trouble to adapt to working demand. MI says that everyone has his/her own learning style as the strengths. The lectures just need to adjust the learning to meet the students’ learning style. In classroom based MI programs (Viens, 1999) learning modes address three goals: create opportunities for students across a range of intelligences (exploration); give students intensive opportunities in areas of strength (talent development); and create more individualized or personalized education by more directly addressing students’ intellectual strengths in their curriculum (using strengths). In the class, the lecturers could attend the first goal by having design which exercises all intelligences; second goal by giving different tasks to each intelligence group(s); third goal by giving individual project to each student. Yet, the following approaches and activities are suggestions to address these goals (Viens, 1999). a. Providing a variety of curricular options. This approach is related to providing students with exposure to and experience across intelligences. Students can hone skills and experience success in the classroom (strength areas), and teachers and students have the opportunity to uncover their own strengths and interests. b. Providing choice among activities or “entry points” to develop understanding or learn skills. Many teachers use MI theory as a framework to develop options for students to work on particular material or skills. Allowing students to learn in ways in which they are most comfortable increases the chances for substantive learning as well as increasing student self-esteem. c. Expanding instructional strategies and media based on the intelligences. We teach in a manner that makes most sense to us. Upon closer inspection, teachers are not surprised to see that they tend to teach from their own strengths. MI theory has been a useful way to analyze and expand instructional practices and the media used. d. Informally assessing student intelligences toward developing educational activities. A definitive assessment of a student’s intelligences is not only difficult, but also not necessary. Informal assessments based on observations, student checklists and questionnaires, and other classroom activities such as dialogue journals and intake interviews provide a context to collect valuable information about students’ areas of ability. This information can be shared explicitly with students, getting them involved in conversations around how they learn best. It can also be feedback into the curriculum. e. Expanding assessment options to allow for students’ use of areas of strength in demonstrating their learning. Analogous to providing curricular options, giving students options for showing their learning and allows them to use ways that are comfortable and through which they can experience success. ..if you’re teaching or learning about the law of supply and demand in economics, you might read about it (linguistic), study mathematical formulas that express it (logical-mathematical), examine a graphic chart that illustrates the principle (spatial), observe the law in the natural world (naturalist) or in the human world of commerce (interpersonal); examine the law in terms of your own body [e.g. when you supply your body with lots of food, the hunger demand goes down; when there's very little supply, your stomach's demand for food goes way up and you get hungry] (bodily-kinesthetic and intrapersonal); and/or write a song (or find an existing song) that demonstrates the law (perhaps Dylan's "Too Much of Nothing?"). This kind of learning designs gives worth experiences to all students. They are challenged to make decisions or solve problem where their interest leads them. In occasions, they appear as independent learners than ever, where passion becomes fuel. Or, they might be confused what to attend if the task is unfamiliar. There could be problems encountered in class, but together, students and the lecturer, will handle it as an authentic problems. The lecturer does not need to feel as the subject who knows everything. Students can give feedback freely. It is because of the environment of learning allow so. Students of any level want fun learning from the teacher. An easy way to know what is fun for student is to do things they are good at. Ability to do things easily is called intelligence. Intelligences are given by God but should be developed by environment to function. Multiple Intelligences is an approach to teach students to develop those intelligences in classroom as well as to use it as learning style. 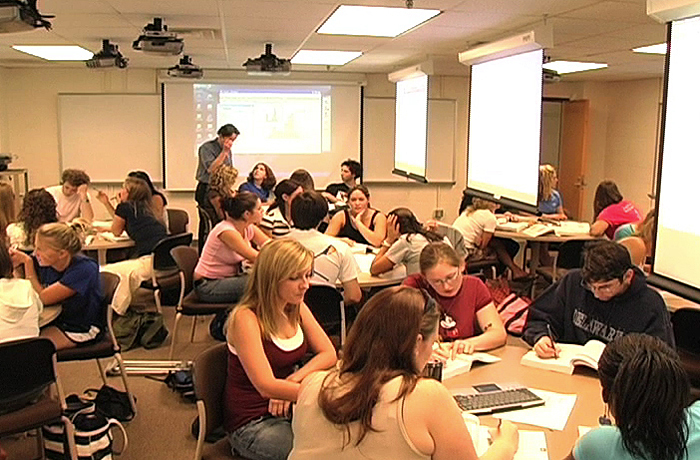 In university level, small group conference is a common learning mode. To make it more effective and fun the lecturers can redesign the learning mode, both to attend the instruction objectives and to facilitate the intelligences in the classroom. Grouping the students based on their intelligence type or interest can be made as an alternative to current grouping arrangement. The students can cooperate with friends of similar passion and gain more understanding about lesson they are studying on. The learning is more interesting because every group comes up with different performance as an exploration of their intelligences. Problem solving is authentic and representation of actual personalities. Forman, E & C Cazden. 1985. Exploring Vygotskinan Perspectives in Education: The Cognitive value of Peer Interaction. In J.V. Werrtsch (Ed. ), Culture, Communication and Cognition: Vygotskian Perspectives. New York: Academic Press. Gilles, R. M. 2002. The Residual Effects of Cooperative Learning Experiences: A Two Year Follow-up. The journal of Educational Research. Jacobs, G and Ratmanida. 1996. The Appropriacy of Group Activities: View from some Southeast Asian Second Language Educators. Slavin, . 1992. Research on Cooperative Learning: Consensus and Controversy. In A. Googsell, M. Maher, and V. Tinto (Eds. ), Collaborative Learning: A Sourcebook for Higher Education University Park; PA: National Center on Postsecondary Teaching, Learning and Assessment. Olsen, R. & S. Kagan. 1992. About Cooperative Learning. In Kessler C. (Ed. ), Cooperative Language Leaning: A Teacher’s resource book. Eaglewood Cliffs, NJ: Pentice Hall. Viens, Julie. 1999. Understanding Multiple Intelligences: The Theory Behind the Practice. In Focus on Basics, Volume 3, Issue A, March. Vygotsky, L. S. 1978. Mind in Society. Cambridge, MA: Harverd University Press. Edu Center. 2006. Intelligence: Multiple Intelligences Theory. Retieve on http://edu-center.org/intelligence-multiple-intelligences-theory.htm.